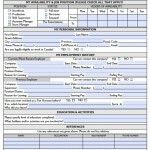 Download and complete the Tim Horton’s job application to apply at any (including locations with Cold Stone) restaurant. An applicant may be asked to handle a wide range of duties from ice cream customers from it’s Cold Stone section to coffee and pastries from it’s traditional use. Step 1 – Complete App – The first thing to do is fill in the form or go online. When completing you will have the options to select various references and write down previous positions held at other companies. You may be subject to an additional background check and if the application is filled in by hand it should be returned to a physical location (next step). Step 2 – Select Store – It is best to find the Tim Horton’s you would like to be employed and go inside the location. It is a good idea to wait until the evening hours when it is slower and having time with the manager on staff will be easier. After meeting, you may be asked to come in for an interview followed by training.